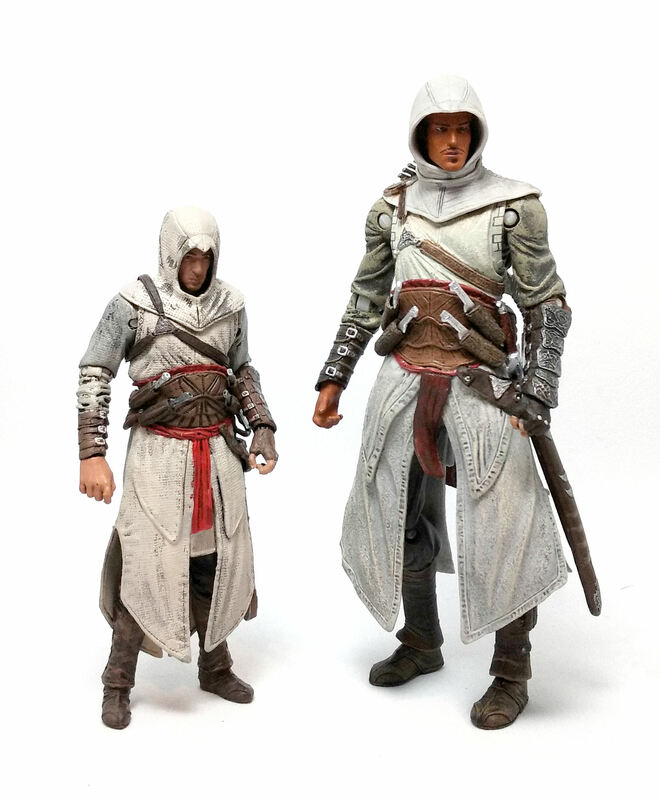 Even though I actually thought the McFarlane Toys’ version of Altaïr Ibn La’Ahad was pretty decent (view Engineernerd’s review here), I still wanted to check out the NECA version released a few years ago. 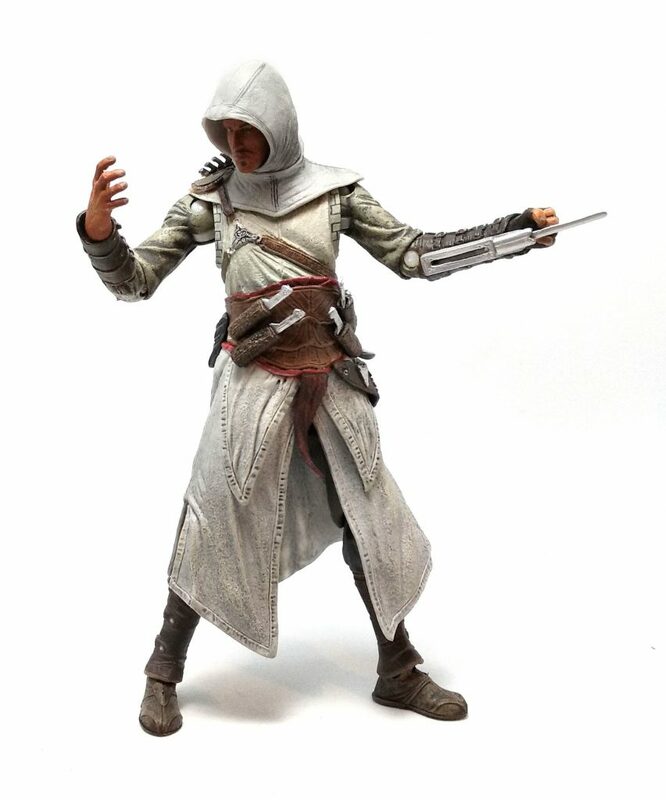 The sculpture of the garment is quite detailed, consisting of an off-white tabard and hood piece, as well as a number of accoutrements representing the various weapons Altaïr earns during the earlier stages of the game. There are four sheaths sculpted onto the front of the belt for throwing knives, but also there are a few more sculpted over the right shoulder and onto the left calf. Note that only the ones at the belt are functional, and the rest are for decoration. 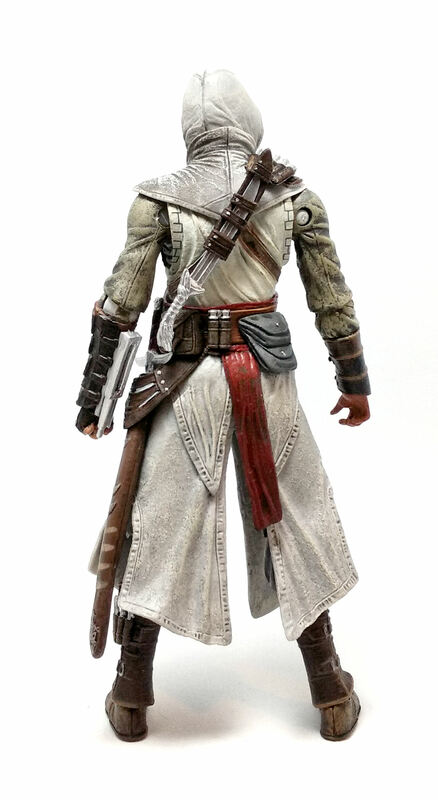 Also, Altaïr has another sheath at his back for a longer knife and, hanging at his left hip, a scabbard for the sword. There is also the casing for the hidden blade sculpted onto the left forearm and Altaïr shows the lack of a ring finger on that hand. The one thing I am not too crazy about is the skirt section of his garments; the material feels rather thick and the flaps flare out towards the bottom in an awkward manner. On the other hand, I found the hood design on this figure to work admirably well, as it allows for full neck articulation while hiding the joint perfectly. • Pin & disk hips. 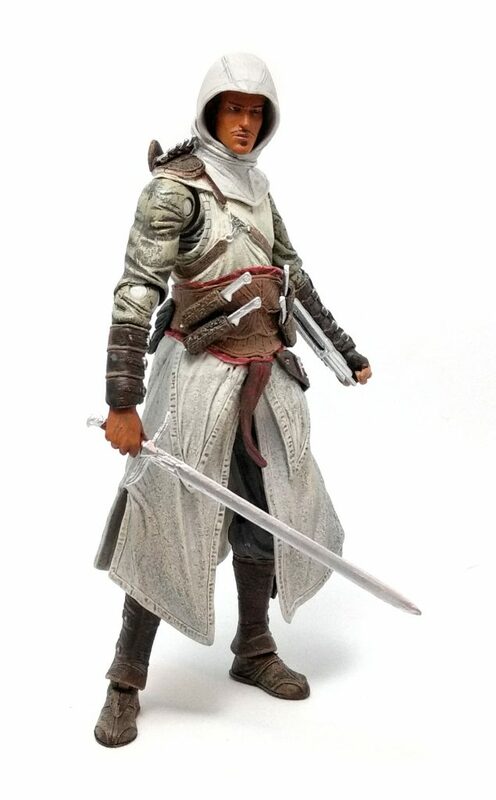 The articulation works well, although somewhat limited by the character design; still Altaïr poses nicely and remains stable without much trouble. The paintjob on Altaïr has its highs and lows. On one hand, the paint is neatly applied on most of the small details sculpted onto the garments, and the crenellated line painted around the armholes of the tunic is a nice touch. The shading wash over the simulated fabric pieces also works quite nicely to bring out the texture. 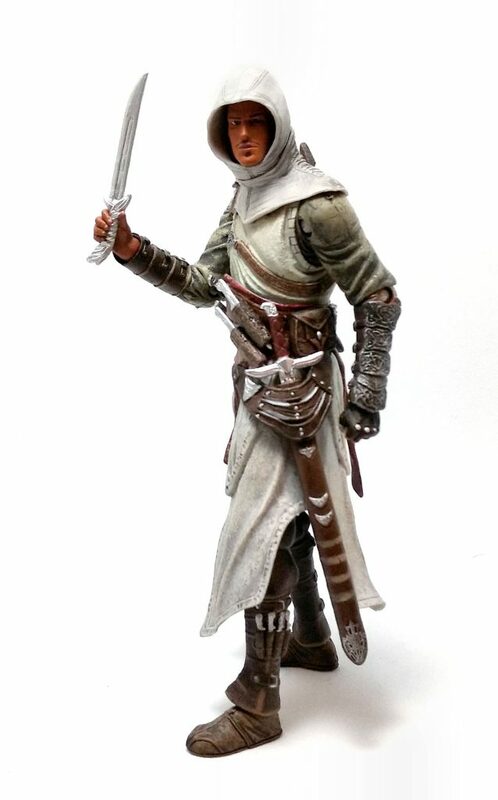 On the other hand, the skin tone selected for Altaïr looks like one of those fake, spray-on tan jobs. Also, I find the facial hair application to be really bad, with the thin-line mustache and half-hearted soul patch under his lip. I would have preferred Altaïr to have no facial hair at all. 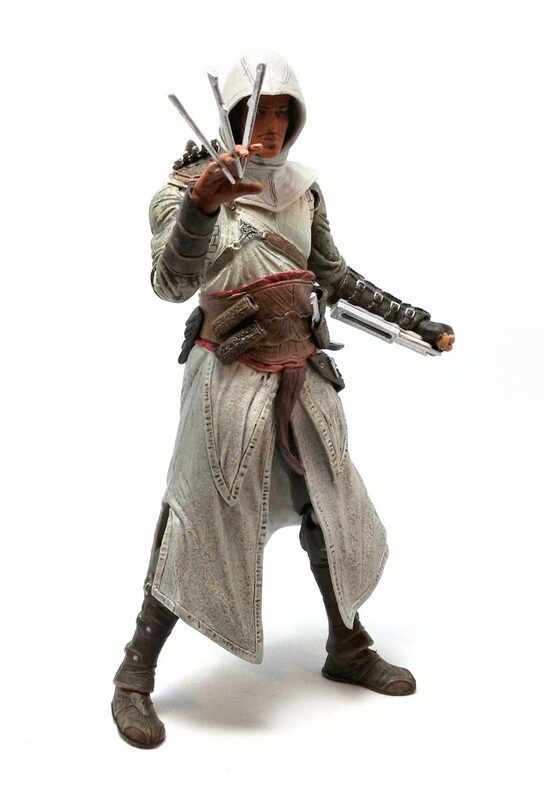 Player Select Altaïr comes with a very respectable number of accessories, in the form of an extra right hand wit the palm open, four throwing daggers he can carry on his belt, a long knife and a long sword. The hand is painted to match Altaïr’s skin tone and has nails and veins painted on. The blades on the weapons are all finished with a highly reflective silver paint and only the sword has a the grip painted brown. The hidden blade can extend or retract into it’s case which, as a result, turns out to be rather bulky but I think it is a fair compromise. The one thing I am not too sure about is that the blade piece has a blunt, square tip instead of a pointed shape but I suppose it was a decision made for safety reasons. In the end, this version of Altaïr turned out to be something of a mixed bag for me. 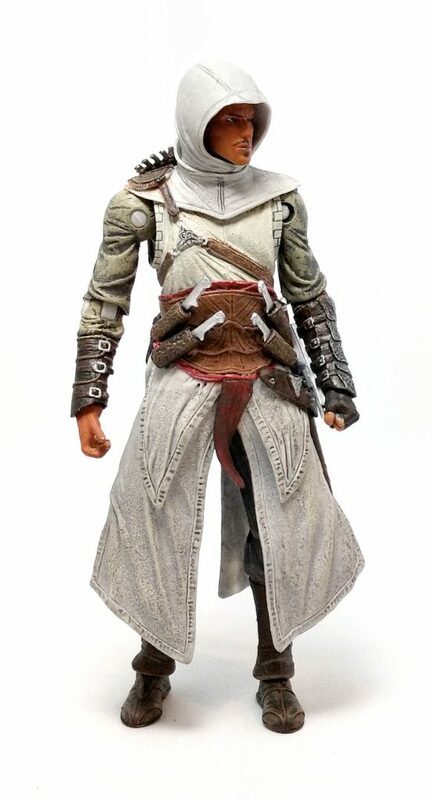 While I appreciate to have all the articulation, it does not afford a significant amount of versatility over the McFarlane version, although it sure is nice to have the extra weaponry and the better hood design, granting NECA’s version of Altaïr an overall positive balance in my book.